Now that we are in 2019. Neutral colors are still going to be just as popular as ever. We are not really a formal society anymore so casual dining is naturally being incorporated into every home. With so much information and images being thrown at us , here is a curated view of some of the most beautiful dining room ideas for 2019. Light bright dining room , with contrasting black chairs. Its casual , light and beautiful. Mid Century Mod is still trending into 2019 , common color schemes are neutrals with blues and varying shades of orange, brown and black as accents …. It’s all about the contrast. White is still very popular , just be sure to add a darker color to give your room some visual weight. Wicker /Woven seating is still going strong and we love it! You can have it all. 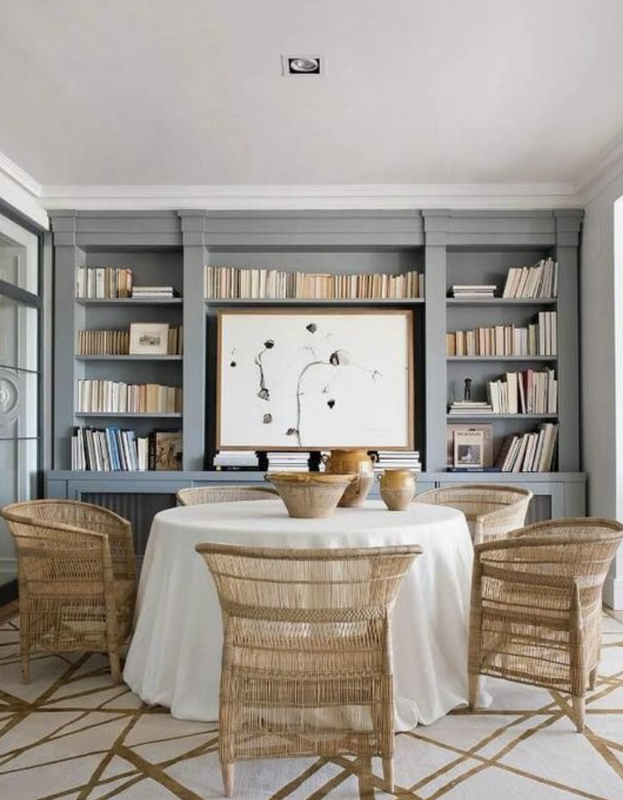 This dining room mixes casual and form styles beautifully. Perfect for the traditional and transitional lovers. When deciding which direction to take your room , color palettes can be hard to select. Download a free 2019 Color Trends E-Book to help you select the perfect color palette in 2019. Stay away from a literal translation. If you like safari ...don't have a mural of an African safari painted on your wall. Look to incorporate something slightly more subtle. Add a cheetah print somewhere... don't go crazy with it.... be subtle. Add colors that you might see in the safari , like the wood on your floor.... Add small items from your travels in a keepsake cabinet or on a table. This is a beautiful example. The room's safari theme is clear but not exactly literal.